Have a link to a great gaming resource, like a map making program, online character sheet host, or SRD? Post it here! Please review available categories before making a new one. Everyone is welcome to post links; however, spam and inappropriate links will be deleted. This is my collection DM Workshop Notes that I have shared with other DMs and players for the PbP environment. It is originally written with some first time DMs in mind playing Pathfinder, but much of the concepts are applicable to other rule sets as well. My first question to ask anyone thinking of DMing is geared to help them focus on what's important to them. Basically, what is the enjoyment you are expecting to take away from the experience? - Is it developing a story and creating a plot? - Is it using NPCs to interact and role-play with the players? - Is it tactical combat? - Is it building a enjoyable package with fun encounters and cool maps for the tokens to move around on? Everyone is different and there might be other reasons or more than one of the above apply. Playing & DMing: Anytime, anywhere. The first DM Workshop is focused on Tactical Maps & Tokens (because it looks to be the hardest part, but really it is not that bad). The rules governing combat are written with miniatures in mind playing a tactical grid. In PbP this is easily simulated and the visual representation really enhances the gaming experience. 3. Some graphical depiction of the terrain. You can use various programs, even Excel Spreadsheets. I have used several methods, but like MapTools the best. Download the Map Tools and Token Tool for free and then install. You will need to make sure your Java is up to date. Then take a look at the on-line video tutorials on their site and to help you get a quick course on their software. After a bit of practice you can have decent and quickly made maps. Nothing flashy in the beginning but definitely functional. The Token Tool is easy to use and you can make anything with a picture or screenshot capture. Making maps is the first part, the second is picture manipulation afterwards. I usually take the exported picture (a .PNG file) and use Microsoft Office Picture Manager to crop and resize the map's screenshot. This is important since you can adjust the zoom level in MapTools ahead of time, but the actual pixel size of the picture exported is too big and needs to be reduced to about 800 pixels wide. Then you need to covert it to JPEG format. PNG format can be rather big for some maps resulting in a picture over 1MB. Conversion reduces that by 80% and makes things much better to load. Once you have a picture for your post, then I would get a Photobucket account and use that to upload it. Afterwards you jsut copy the image BBCode link into your post. There are other sites that do that as well, but Photobucket is free and easy to use. Here are some downloads for resources that provides tons of objects, terrain, and tiles. They are big, but worth it. In PbP, compared to playing around a table in RL, things move glacially slow. This needs to be taken into account when planning the adventure ensuring XP & treasure awards increase proportionally and appropriately. It can take seemingly forever for characters to advance a level. Ideally we should shoot for leveling up every 3-4 months if possible. In a typical game rewards are given from combat encounters in a balanced style of gameplay. Other methods of XP/treasure awards will be covered elsewhere. Based on average encounters when playing around a table, players would expect to level-up every 12-13 encounters. That is way too slow in PbP; every 5-6 encounters would be ideal. To do that without bending the rules, requires increasing difficulty of the encounters to increase the rewards. In doing so, you have to plan things to ensure the characters can survive multiple encounters, like getting access to healing or being able to rest often enough. Long adventures and campaigns can take forever as well, trying to remember plot point over months or years can be hard. In PbP you are better served with shorter adventures so players get more satisfying feel of progression. Ideally for the DM, it is probably best to run the adventure to the players from having just leveled up or starting fresh at no XP, through to just reaching the next level once they finish the final encounter. This means the difficulties can be consistent throughout. However, by road mapping the encounters ahead of time, the DM can predict when the characters will level up, so the difficulties later on can be planned accordingly. Most published adventures are already balanced as far as rewards, taking into account XP and treasure. But, the progression is designed for playing around a table and will be too slow without adjustments. It should be reworked. Here are some ways to do that. 1. Use Time-based awards to supplement the encounter awards. This is an example of a short adventure for 1st level characters with 0XP using the Pathfinder rules. Initially we will look at a basic template with 5 encounters. We have our monster lair/haunted house/abandoned keep or whatever. Out heroes are probably going to have to do this in one or two attempts for story purposes. So unless they have decent healing, they might not be able to handle all of it in one go around if it is too hard. This is particularly a problem on the first adventure, so we need to keep this in mind. I will use a simple Kobold lair for an example. When you set the Challenge Rating (CR) level of the encounter, that determines the XP your monsters should have totaled together. So for a Challenging Encounter #1 should be CR2. (ie. 1 Wolverine). Enc #2-4 are the sentries, kitchen, and barracks of our kobold lair. There are various numbers (2-4, but we will use 3 as an example) kobold warriors (CR1/3). Maybe one encounter (#3) is a CR1 trap. But these are really just warm ups for the big fight at the end. Since there will not be any resting from Encounters 2-5, there needs to be some treasure to assist in the Boss fight. Maybe some healing potions and a masterwork weapon or two. Maybe the person hiring the heroes sends along a healing potion with each player from the beginning. Use Fast column and Average Party Level means CR of the encounter. The total treasure for the adventure needs to be around 3200gp. Some encounters might not have any or very little treasure, but you make up for it in other encounters. But we cannot load it all up in the final one either, since we might need our heroes to get some better gear and healing potions ahead of time. The final amount of treasure also includes all the gear salvaged and rewards offered at the successful completion. So if they were given healing potions at the start, those are counted towards the final total as well. So that is a simple cookie cutter to make a short adventure. But, let's look at your player's party situation. Before you finalize the treasures, take a look at the party doing the adventure and predict how they can heal and recover spells. If you have a break where they can return to town to rest and buy some healing they can handle tougher encounters. If they get a supply of healing potions, they can keep going without a cleric along or after using up the healing spells. There are various ideas to deal with this and the DM will need to look at how to handle it. The goal is to make the encounters hard enough to be fun and provide the most XP they can get without killing anyone by accident. Advancement is pretty slow in PbP, so if we can add some thing to increase the heroes staying power to fight the encounters they advance quicker. After an adventure or two, the players will take care of this themselves and we don't need to worry about it as much. Maybe one of those CR2s is a Skill Challenge and another gets split into two CR1 traps. So without even talking about story, we have an overall framework of an adventure and map to go with it. Your map and bad guys can help you even write the story. You can increase the CR level with gear more appropriate to higher levels. This automatically also increases your treasure too. I have done this for PbP and it helps accomplish the task of increasing the speed of advancement. Going back to the revised template above with the kobold lair example, I increased the CR to 4, but did not simply add 3 more CR1/3 warriors. Instead, I bumped up the individual CR ratings with some minor adjustments. So the foes are still a 1st level fighter, 1st level Spellaster, and 3 warriors. But, I increased the CR of the leader to CR1 and the warriors to CR1/2. Upgrade his armor to MWK and increase it to one level higher to get +1AC. All of that justifies a step up to CR1, but is not as deadly as two CR1/2s. Better selection of weapons (Maybe had Spears and Slings before) to include reach weapons polearms, good one-handed weapon, and longbows. The scheduled periods where the characters can rest and recover, with the possibility of even shopping, is to allow characters (healers in particular) to recover powers and use treasure to cheaply purchase healing spells from NPC clerics when in town. If they have to camp outside and just rest up until healed naturally 2-3 days, then so be it. Because we are pushing them hard with challenging encounters, we need the players at optimal fighting trim. If we were around a table, fighting some simple wandering monsters that last 2 rounds are no big deal to slowly gain XP. But in PbP, even that combat needs preparation and takes time. I have played first level adventures where we had 4 encounters. Each one was CR3-4 and we rested and recovered after each one. Then by using recovered loot, we were better equipped to deal with the CR5 boss encounter. Much easier to do in an urban type adventure, but recovered treasure or a pre-payment of a healing wand (10 charges) can do the same thing. Arcane casters may not waste their best spells either for the easier fights, so really the party can continue as long as they can keep the HPs up. As a DM, if the players can burn up resources to keep from having to stop the IC action to rest for the night, then give them the healing. Wands of CLWs are becoming staples in all of the D&D PbP games that I am a player in, particularly with clerics not being popular and still only having a few spells at low levels. In many ways, a skill challenge is like any other encounter. It has opportunities for success and penalties for failure. It requires multiple heroes to participate and often has both obstacles and antagonists. However, whereas combat encounters require the heroes to use weapons or special attacks to achieve victory, a skill challenge requires them to use their skills and creativity to succeed. Apparently this is something that was developed later (for D&D 4ed and Star Wars Sage Edition), but I don't see why it won't work under Pathfinder or even D&D 3.5ed. Just keep in mind that both 4th Ed and SWSE have significantly less skills too, so it makes it easier for those rules. Pirates and adventure on the high seas haven’t always been the typical D&D adventure setting. However, almost all PCs are required to travel by ship at some point in their adventuring career. The skill challenge below tackles the issue of surviving during a raging storm at sea. 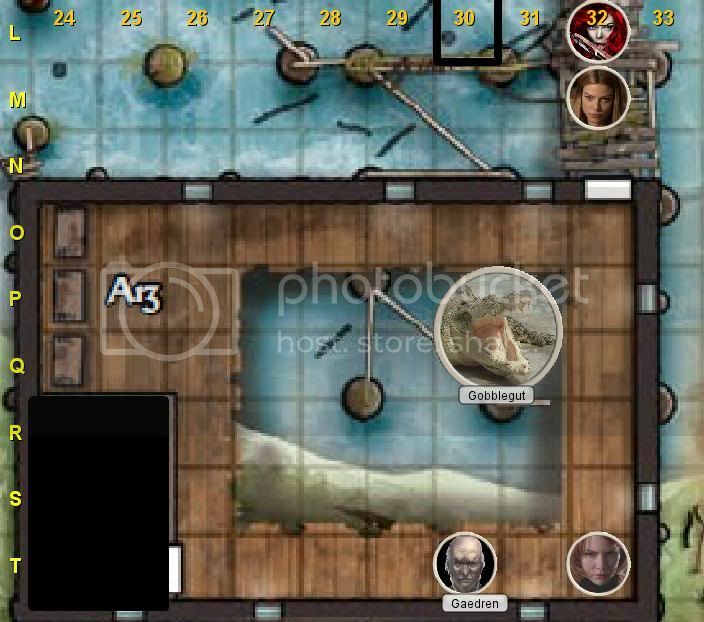 Setup: The PCs are traveling by sea and are beset upon by a raging storm. Will they survive unscathed or will they succumb and sink in the chilly depths? •	Each skill can only be used to accomplish 1 success towards the overall skill challenge unless noted otherwise. •	Skill checks denoted as assist do not count as a success or failure towards the overall skill challenge. At the beginning of each turn, each PC must make a moderate DC Acrobatics check to maintain their balance. The DC becomes hard for any PC who climbs the rigging. Additional details are provided below under Acrobatics. Success or failure on this check does not affect the outcome of the skill challenge. However, a failure will result in a -2 modifier to that PC’s next skill check. You find a loose rope and tie it off. You’ve managed to climb up the rigging. However, keeping your balance up here is another task. Use of Acrobatics in this manner does not grant a success or failure, it merely positions the PC to take additional actions not available on the deck. Additionally, any PC up in the rigging gains a +2 circumstance bonus to Nature or Perception checks. Any PC who climbs the rigging must make a hard DC check to maintain their balance each turn. Failure by 5 or more results in the character falling to the deck below and taking 2d10 points of damage in addition to the normal -2 penalty to skill checks for loosing their balance. You see a crew member loose their balance and slide overboard. You are able to grab them before the sea claims them. You strength can be put to good use by securing the sails from above in the rigging. Use of Athletics in this manner does not grant a success or failure, it merely positions the PC to make an acrobatics check to tie off a loose rope. Additionally, any PC up in the rigging gains a +2 circumstance bonus to Nature or Perception checks. You grab a loose rope and have pulled it tight to keep the sail taut. However, there is nothing nearby to tie the rope to. You opt to use your own weight as the anchor. The crew have lost their composure and chaos is loose upon the decks. With the authority of your voice you gain control and restore order. Your knowledge of the wind and waves allows you to suggest an alternate course to the captain which might allow him to steer out of the storm. You detect the scent of a fresh wind coming in. Your keen eyes see a break in the storm off in the distance. You recommend that the captain alter course to find calmer seas. Success: The ship comes out of the storm relatively unscathed. The journey is able to continue without much lost time. Failure: The ship has been damaged and the journey will be extended by 2d10 days. Additionally, all PCs loose one healing surge. If a PC has no healing surges remaining they instead take 2d10 points of damage. Is that a shaughain boarding party in the distance? In this skill challenge, the heroes are trapped in the spice mines of Kessel and must escape to freedom. The spice mines are currently under the control of the Colicoids, an insectoid species responsible for the design of the Droideka. The heroes have a chance to escape while being herded back to their barracks, and their goal is to make their way out of the mines, through the detention facility, and out to a landing pad where a spice-hauling vessel is refueling for take - off. During the breakout, 10 other prisoners also decide to fight their way to freedom, helping the heroes escape. Perception [DC 18]:The heroes can keep their eyes and ears open for the signs of approaching Colicoid guards. Alternatively, the heroes can search for side tunnels and passages that are rarely used. Persuasion [DC 23].•The heroes can convince some of their fellow prisoners to keep watch or fan out to distract the guards and prevent them from catching the main group. Stealth [DC 18]:The heroes can attempt to sneak by Colicoid patrols and to ensure that none of the other prisoners makes too much noise. Survival [DC 28]: The heroes can search for signs of Colicoid tracks in the tunnels they are following, using that knowledge to determine which passages the insectoids are least likely to search . of non heroic prisoners that reach the ship and escape. Success: If the heroes succeed, they make their way to the Lantil lian short hauler sitting on the landing pad. They successfully steal the ship and jump into hyperspace. Failure: If the heroes fail the skill challenge, they are cornered by Colicoid guards and must engage in a difficult combat encounter to finally gain their freedom. If the heroes succeed but accrued one failure during the challenge, only five of the other prisoners make it to freedom with them. If the heroes succeed but accrued two failures during the challenge, none of the other prisoners reach the short hauler-all 10 are recaptured by the Colicoids. How much should you tell your players during a skill challenge? In a combat encounter, the players know that they are engaged in combat and t hat they will act in a certain order, and they have a good idea of what they must do to succeed. A skill challenge, however, can be a bit more ambiguous. Total Disclosure: You hide nothing from your players. You tell them when they are in a skill challenge, what ski lls are their best choices, how many successes they need, and any special rules that apply to the skill chall enge. You might even reveal the DCs of the skill checks they must make. Because of t he focus on game mechanics, this kind of transparency works best for skill challenges that have little dramatic tension, such as those without direct antagonists. For example, a skill challenge in which the heroes must work together to rebuild a broken-down cart is not a particularly dramatic scene, so the mechanics would not disrupt the flow of the game. This might also be better in the PbP environment for us inexperienced people with skill challenges in general. example, a chase sequence through city streets provides an interesting narrative, but you should make the scene's game mechanics obvious so the players realize that their actions have immediate consequences. Secret Challenge: You hide everything from the players, including the fact that they are in a skill challenge. You keep track of the challenge behind the scenes as a means of directing the flow of the game or providing experience points for a noncombat encounter. This kind of transparency works best for scenes that rely heavily on roleplaying and dialogue (such as negotiations) so that the game mechanics do not interfere with the drama . This degree of transparency also works for skill challenges that take place over long periods of time, since it allows the plot to develop naturally without the players worrying about the skill challenge. I am not sure I would attempt this in PbP because people forget things over time. Also I think it requires more experience on the DM side as well (meaning I am not sure I could do it either and have it work out. LOL). A Complexity 1 skill challenge should yield as much XP as defeating 1 monster of the same level; a Complexity 2 skill challenge should yield as much XP as defeating 2 monsters of the same level (800XP), an so on. For a DM, creating a skill challenge from scratch, this is a good way to conceptualize how significant your skill challenge really is. For example if the PCs are level 1, then according to the Core Rules fighting and defeating 1 typical monster (CR1) should net the PCs 400XP. So overcoming a Complexity 1 skill challenges should result in about the same 400XP reward. In a typical Complexity 1 skill challenge, normally the PCs must achieve 4 successes before 3 failures in order to get the XP. If they succeed with less that 4 successes without getting the 3 failures (due to some ingenuity, creativity, or something), then they still get the XP. For speed and simplicity, skill challenges use only flat DCs to oppose the PCs’ skill checks. Opposing them with skill check results builds too much randomness into the system. If you want to include opponents’ checks in your skill challenges, use their passive checks (10 + base skill check bonus). Sense Motive and Perception are the skills most often used in this way. 1. DM should always roll ALL of the initiatives so there is no waiting once the encounter kicks off. No decision making on the players part, so why do they need to roll themselves? However, if one believes differently that players should get to roll for things like that, then pre-roll 3-4 Initiatives and the DM saves them for when needed. Needless delays in PbP should be avoided; things move slow enough as it is. 2. Group Initiatives helps keep flow going when people can only post once per day. It means that if you are not waiting on results from other players actions or delaying until after someone else takes their turn, a round of combat can be posted in 24-36 hours and we can realistically complete 3-4 rounds of combat a week. In PbP this is good. This has worked well in all of my games here and everyone enjoys it better. I also tend to put a 72 hour limit on the players round before NPCing the lagging players too. 3. However, individual Initiatives are good for better tactical environments, particularly when the opposition is not grouped all together (I think it should be all or none, btw). In a game with only 2 players, 1 round takes about 24-48 hours. In a game with 3 players, 1 round takes 48-72hours. So with 5 players & a DM, we will average 1 round per week. If the DM is available to post more than once per day, that can get shortened and actual order of the players' turns will cause variance. But, all it takes is a player to have their turn come up 1-2 hours after they went off-line for the night, then if they cannot post the next day for some reason you easily have a 48-hour delay for everyone else. These individual delays add up, so if it takes 36-48 hours per person to update their turn, the next thing you know it takes 2 weeks for 1 round. Not good at all in my opinion. Group will keep things moving faster without much downside. Individual can provide some interesting tactical considerations and challenges, but can significantly slow things down. With 6 people, the trade-off is not worth it to me, and the tactical considerations are a part of the game I like best. Someone is bound to think that they don't need to invest in bonuses for initiative then. Not true, if Initiative is rolled the way I do it (again DM rolling them all). 1. Roll Initiative for every participant individually (even each monster individually). 2. Then average each side for the order between good guys and bad. So high initiative helps your side. 3. However, then check for any individual Initiative rolls on the losing side that beat all of the winning side's rolls. If that applies, then those characters (and only they) get to act first in a pre-Round 1 and then they go again when their losing side goes during second half of Round 1. So that Rogue or Wizard with Improved Initiative helps his side win, but if his/her side loses yet they still beat the other side individually, they still get to go first. DM Workshop #5: DM Notes and Combat Management tools. I have gone through a few evolutions of this to refine it over the last year. I have seen other PbP DMs also provide the foes AC and current HP as well, but I think that provides a bit too much meta-game thinking. Once I have developed the post once, I always quote the last one on the thread to ensure I have exactly the same information on the newest. The information contained allows tracking of the most important elements that frequently change and players can see the information to catch the discrepancies as well. The player's combat spoiler block with mini-stats, helps ensure they are on the same page as you. It also serves as a reminder of what is in their hands as it can make a big difference on Round 1. Things like AC and HPs are dynamic and both the player and the DM should have the same numbers. It also provides a place to record the character's actions in terms of game mechanics with links to their dice rolls. You will note that in WERE, I do include ACs and even HP for unnamed opponents. The only reason I did that was so the two players can write their own dramatic combat posts and they need to know the results ahead of time. I consider WERE a special case as the writing is more important than the gameplay. Besides the on-line posts tracking things, the DM needs to have his own tracking sheet. Since you cannot recover numbers once you edit and save a post, you need to have accurate notes. I have developed an Excel file for PF games to include the numbers of important things to track. I usually print it out and fill it is by pencil. Here is a version that shows it in use so you can see how I fill it in for each encounter. I keep these hard copy records so I can always go back and look at treasure and XP totals to fix discrepancies. Forum Structure to assist in Tracking Campaign details. The DM should have this information recorded and visible for all the players to see. Either in the opening post of the game thread (if only one is used) or in a separate thread in the game's sub-forum. That post with the linked character sheets and the character's XP is valuable. Since you cannot recover numbers after you change them, you need to log the individual awards so the numbers can be recreated easily. Around a table this is the responsibility of the players normally. But with PbP, the records need to be accurate and put into a post. I tend to make it the post right after the XP awards summary. Unfortunately, under normal circumstances, only the DM can edit posts in their game forum at URPGs. But with Admins and Global Moderators participating, they can edit as well so this burden can be shared. Ultimately the DM has to enter the treasure though. The best way is to list the treasure gained together, sorted by encounter. At any time, the players can total it all up and sell it off to divvy up the gold. I cannot say that I have done this the best way in all my games, but as long as you have accurate records, then it gets the job done. In the 9 games I currently run, each group is a little different (numbers of players, posting frequency, and styles), but there are some basic things that hold true. 1. A game typically progresses at the speed of its slowest player's schedule. This can be amended to the second slowest player in larger groups if the slowest is typically skipped and just posts when they can outside of combat. 2. OOC communication on who is next to post and when the scene should be advanced ensures smooth flow. No matter what style of game being run (heavy RP or balances) there are some basic courtesies that should be kept in mind. Typically, the players should be posting in a pattern of exchanges, very similar to when they are in combat. What this means is that after a DM update, all players should have a chance to react and post before the next significant thing happens. The DM is the one that can control this. For example: One character moves forward to talk to some NPCs and greeted them. Two players observed the situation and commented to each other. That leaves the other two characters yet to post, before the DM should post a reply to the speaking character's greeting. With a group of 5 players, this can slow things down, but it is proper etiquette. So normally, the DM should not post more than once in a 24 hour period during role-playing so everyone has a chance to take a turn. However, not all groups are the same and there are always exceptions. The diplomatic character could be controlled by the player that is the most frequent poster. And, among the other players, some do not or cannot post daily and have not minded when things keep flowing without them. So after an adequate time period has passed, the DM could post a reply without waiting too long since the other players are expecting the diplomatic spokesperson to do all the significant talking with the NPCs. They accept that they get skipped a time or two and catch up on their next post or just play things from there. But still the DM would not be updating more that once a day most likely. Another exception, is when direct questions are asked that need to be answered much sooner instead of holding the game up. These might be a character asking a question that requires answering before anyone can post again, or it might be the results of an action everyone is waiting on. These are judgement calls, but can be pretty obvious. Usually DMs don't wait and answer right away. When the player and DM are on-line at the same time, posts can be exchanged quite fast, but proper etiquette would mean that they not post more than 1-2 times each before allowing the other players to react or participate. However, those posts should probably be shorter, like speaking in a conversation without long monologues. Of course, DM updates in combat don't follow these guidelines and are another exception. This can be communicated easily with players putting an OOC comment that they are ready to move along. This is good, and the DM should not take this as impatience on the player's part. Better yet, this can be done IC as well by posting something like, "Character X grasps his longspear and moves forward once his companions are ready." There will be times where half the party is ready to move forward, but the other half are interacting with each other and should be allowed to play that out. This is part of the fun. As a rule, the scene should never be advanced significantly in time without clearly knowing the players are ready. I have some games where the players are continually interacting and you just have to ask them OOC if they are ready or not since they will keep going for days RL otherwise. After combat ends, the players should have each have ample opportunity to react and interact. This could last 2-3 days while the characters talked to each other, searched for things and dealt with the dead bodies. Duirng which time the DM provides answers/results only until they are ready to move on. If the players are not helping advance the scene, the DM can simply ask if they are ready or just tell them he plans to advance the scene the following day. Simple OOC communication can go a long way. However, a better way would be that the players post their characters finishing up, then exiting the battle site to inform their employer they completed the task. They mount their horses and start moving down the road again. Then without even asking, it is clear that it is the DM's turn to advance the scene in REACTION to the players. The players are the heroes of the story, they would feel somewhat in control of their destiny, even if the adventure is linear. Which style is best depends on the players really. I have found most players are not comfortable with Player Driven scene progression, and rely on the DMs to do all the work. With that in mind, most players react to the scene and talk to the other players. They do skill checks when they think they need to be done. Then that's it, waiting for the DM to move things along at some point (usually when people stop posting ). Mentioned previously, sometimes there needs to be more XP & treasure given to ensure the game progresses the characters through the levels fast enough. Particularly in a heavy role-playing styled game where combat encounters are not the focus and might be significantly less frequent. The DM will need to consider other methods of awards to keep the leveling up on an acceptable pace. This goes beyond just arbitrary awards for XP, since character wealth needs to increase appropriately as well. Effectively a participation award. The best way is to take the amount of XP needed to be awarded to keep things moving. Divide that by an appropriate time interval (days, weeks, months) and award it as bonuses. The actual value will increase the higher the level of the characters since XP progression to level up in d20 systems is not linear. Awarding bonuses for achieving plot objectives are purely subjective. But they can be based on keeping the characters leveling up at a consistent rate. The DM has the responsibility of setting the tone and level of role-playing in the game. The players will generally reciprocate in kind if they are able. Best thing is to treat it like scenes in a movie or TV show, describing the setting and actions. No one wants to read posts that contain only game mechanics. Not posting any IC content is detrimental to a game. I feel this is something that feeds off other people as well. When one person continually puts in some effort, but others reply with only one-line of IC content, it is very disheartening. During combat, at a minimum, every player should be able to post one sentence for each Move Action and Standard Action. Then your character should be able to find something to say. Outside of combat, then you have more that 6 seconds of activity to describe, so at least a paragraph should be no problem. This is above and beyond the quips and such your character says in response to each other. Combat is not an excuse to stop player interaction. Heck, not even an excuse to stop NPC interaction in many cases. Too bad undead and animals don't talk so you can trade insults. But, your characters should be communicating IC too, telling each other what their intentions are for your next action is at least a starting point if they have writer's block. I have played in groups like this where there appears to be very little effort. I usually end up dropping them as a player because it is a waste of my time. So I challenge people to put in more thought into their role-playing and try to improve the experience. Ultimately this comes back to the DM, leading by example. "Garbage in will mean, garbage out". There are a few things that are expected of a DM, beyond just setting up an adventure. There is a lot of preparation and hard work that goes into it, but that is not where the DM's responsibility ends. 1. The player's gaming experience. The players are interested in having fun. If the adventure is not set up to facilitate this, the DM is failing in their job. There are some things that just do not work in the PbP environment. And there are some things not all players are capable of doing. So occasionally a DM needs to get feedback and look at things from the players perspective to ensure things are going well. It doesn't hurt to ask OOC what the characters like and what they think needs improving. It is their game too. Encounters that drag on too long, beyond 6-8 rounds while the players have to chase down the cowardly foes. Repetitive Encounters, fighting the same thing again and again. Giving the bad guys, OOC insight into the player's characters and their capabilities. Allowing creatures with low intelligence to make intelligent decisions, essentially not acting in character. Not responding to the player's role-playing within character. Ignoring the player's creativity and just force them into your plan for things. Moving things along before the players are ready. The DM needs to remember the characters are the protagonists of the story. They need to have opportunities individually and as a group to shine, where they can show off what makes them special. They need to feel like they are more than just rolling dice and following along. They want the game to be interactive. 2. Being fair and impartial. The DM is the Judge, and as such needs to police himself to ensure he is not bending the rules for his own gain. The experience is not a us versus the DM, but more of a cooperative experience. The idea is for the players to win, therefore the DM controlled forces need to lose. But as things are difficult and challenging, the DM needs to be aware of how things will look from the player's point of view. Particularly when determining the opposition's tactics. When the dice start going against the player's it is good to have some OOC communication to explain what is going in terms of game mechanics. Particularly when the IC writing is just describing the results of dice rolls in terms of the bad guys actions and motivations. Random targeting, best used when the monsters/bad guys are not so intelligent. Document generic tactics and plans when designing the encounter. Sometimes the bad guys make mistakes, particularly if they are not aware of what the player characters are capable of. The DM should consider the opposition in character and try to make their decisions on what the realistically know. 3. The game's tempo. How fast the game moves is determined by the DM and most likely the player that posts the least. The DM needs to ensure the game moves forward at the appropriate times. Some situations need to be moved along faster than others. However, there are times when the players want to sit back and smell the roses, interacting and bantering between themselves. Generally a DM can figure out after awhile how often the individual players post and things will develop a pattern. But if the DM slows things down, the players tend to reciprocate with slower response times as well. It is best to establish the intended posting frequency in the beginning and communicate this so everyone knows. There are certain courtesies that should be observed in PbP games. The DM needs to establish them and help ensure the players observe them as well. When players address NPC's or ask questions, this needs to be followed-up, even if the result is nothing. No one likes to feel ignored or that people are not reading their posts. When in combat, things are generally pretty structured and players take turns. But this should also be somewhat the case in freely role-playing as well. Successful games generally have the players all participating equally for the most part. It is accepted practice that a player should not post twice in a row under normal circumstances. Carrying that further, in short periods of time, people should not repeatedly post either, without allowing ample time for the other players to react to the posts. The DM controls this by determining when results are posted and NPCs respond. Dungeon Crawls can be the bane of many a PbP game (outside of player attrition). There is nothing like repeated posts of "I will move down the hallway to the next door to listen and look for traps." Every game can have one, not just D&D. Many a published adventure for D&D has them, but they are also expected to be played face to face around a table where you can accelerate things much easier, too. With that in mind, I think it is a art to figure out how to get through them in PbP, while keeping interest up. Determine what you want your players to get out of the dungeon itself. If they need to explore everything, but there are several empty areas and a few traps to keep them cautious it can take a long, tedious time. But the main point of playing is to have fun. Spending days RL moving from one corner to the next as the map is slowly revealed is not fun. The DM cannot expect the players to role-play meaningfully with nothing to react to either. So, if the point for the dungeon is to find a few rooms with monsters in them and a few traps, then everything else is just dead time in between. There needs to be a way to accelerate things, yet preserving the obstacles and surprises. This is the art of managing a dungeon crawl. 1. If there is a natural leader of the group, let them make executive decisions so there isn't a debate at every intersection. You can even establish this policy OOC. Or perhaps the rogue who is leading the way looking for traps is designated to make those calls. 2. Streamline trap searching. This is usually what is keeping the DM from just moving the scene along to the next room as there needs to be a chance to look for them rather than stumble into them. Any experienced player group will automatically do this if they think there is any chance. You can establish a Standard Operating Procedure for it and then operate with it in effect. It is easy to use taking 20 on Search or Perception as they explore, but sometimes there are time constraints that make it impractical (for example, the wizard's Mage Armor spell only lasts and hour). Usually at lower levels taking 10 is too low to find the expected DC of traps too. Best thing is to establish an effective Take 15 or something in that ballpark instead of just rolling dice. Since there is no consequences for failure, you can keep rolling until you beat a certain DC regardless. However, I just have my players do this: "Search (+7) until beat DC22" Essentially the DM rolls the Search checks when necessary. And, it is only necessary when the DC of the secret door or trap is higher than the DC they set for their searching (DC24 for example). But, since they are not Taking a 15, the DM needs to roll to see if the dice roll to beat DC22 is able to beat the higher DC. So they might get lucky and find that harder trap anyway before they walk right into it thinking there is no trap. 3. Consider providing them a map to help with exploration. Instead of just using a tactical grid for combat only, I have them move their tokens around in every post. Essentially the dungeon becomes one large tactical grid. You could even provide the whole map itself ahead of time (though never did that myself) completely OOC knowledge if you can trust your players with that. But, you can give it too them for an IC reason instead. Provide them a crude "treasure map" that gives the basic layout of the entire dungeon to allow them to provide more general courses of actions to streamline the exploration. Otherwise you will have times where the lead person is going from corner to corner to wait for map updates. 4. Make sure every significant DM update leaves something for the players to react to. If the hallway continues along with some turns but no intersections or doors, don't stop in the middle unless there is a good reason. Better to just move them all the way until they reach the next intersection or whatever. Then post OOC to tell them why and if they had an action they wanted to to do, let them retroactively do it. As usual, continual OOC communication can go along way. 5. When there are lots of rooms that are not empty, but don't contain much of importance (like treasure, traps, or encounters) then find ways to group multiple locations together in DM updates. I ran a group through a 15 room lighthouse that had no monsters, traps, and very little treasure, but they needed to go through it for plot reasons and there where things to see. I ended up advancing them level by level (5 floors) instead of room by room, assuming the lead characters would step forward and look into the next open doorway to make sure it was empty of monsters. 1. I look at it like this: every IC post is like a snapshot of time from a scene of a TV show. Even if your character is doing nothing important, he/she is doing something. Just describe it. No one stands around silent and statuesque all of the time. People are social, look at all of the people that cannot help writing comments and replying to forum messages with something to say. So why is it so hard to imagine what one's character would say at any given moment? It kills me that some people cannot post at least some action and a piece of dialog every IC post. 2. The point that I think many people miss is that they feel role-playing is mostly about what your character says. I will try to quickly give an example for what someone could be doing with Grog, a strong and silent type character that is an all too common choice. Grog follows the conversation between the gruff man and the chatterbox half-elven slip of a girl, glancing at each in turn. Finally he rolls his eyes as they continue to bicker like brother and sister once again without signs of stopping. Some days it is entertaining, yet other days it is a distraction. But right now, they have work to do. He grunts out, "Enuff. Let's move." To emphasize his impatience, he squeezes his right hand and the knuckles crack. He grasps his weapon tighter and rolls his shoulders, slightly flexing his muscles in anticipation as moves into position to descend the stairs. 3. Not posting does NOT mean your character is standing around with nothing to say. Not posting is not participating or playing at all. People that do that are actually negatively impacting the game. A DM should either avoid them as players or boot them out if they don't change. 4. The opposite side of people posting are the ones that do not post much description of what their character does, but thinks good role-playing is based on how much their character says. They hold a conversation posting paragraphs of dialog without even considering the other characters might reply or react to the first few sentences. I call this monologuing, not good role-playing. The DM's NPCs are no different, they should not do this either. 5. Some players fail to post any non-dialog at all in a post. This is an amateurish and lazy habit. Every IC post should start with the character's name and be written as a sentence at least. If a character is always talking TO someone or replying to someone. If they are not, then they are "replies to no one in particular" at least, right? Most DMs are looking to find those players they can rely on to stick around and who will make the game enjoyable with their writing and interaction with others. Often it is the player, not their character concept, that is more important. Any player you meet for the first time can be one of those that will enjoy role-playing with you for years, or they could disappear after a few weeks. Sadly, statistics have most new people disappearing within 1-3 months, maybe 10% or less last more than 6 months. So in getting started, what can you do to get people interested while waiting for the game to really start and find out who will stick around? You can designate a pre-game IC thread for the applicants to strut their abilities and actually prove themselves. Combined with a some other character generation requirements like descriptions/appearances, personalities, backgrounds, strengths/weaknesses, etc... each applicant will have to invest thought and creativity way beyond making a character sheet. You designate the Location as a DM-free Sandbox. You might even provide the layout and various locations with the area of the sandbox. Or, if the boundaries are well defined, let the players run with it and make it all up. You give them the basic guidance and initial setting information to let them move their characters around and interact with the other players they encounter. Then you, as DM, just sit back and read. If anyone needs an NPC, they treat them as props, but they should be focused on interacting with each other instead. 1. You get to see how players will work together. 2. You get to see how frequently they post. 3. You get to see if they can write and format their posts. 6. If you let those applicants who don't make it continue the free role-playing after selections, you have a replacement pool of players/characters available as well. 7. The players get to test drive their character and enjoy themselves while the wait. This does mean you will have a lot more to read than just applications. But, in the end, you will still have to sit down and decide the players you want and in this process your job might be easier than you think. You will also get more players to tryout even after the initial push for recruiting, realizing they have a chance since applications without role-playing are not going to be considered. 1. More players means more chaos, and even some decent players cannot handle it. 2. In two weeks you could get 200-300 posts on a big site. 3. Without good structure or defined space, some people are just lost on what to do. 4. On a small site, the exercise is not going to screen people out if you don't get more applicants than the number of players you are looking for. When I started PbP DMing, I was keeping thinking that players enjoyed the mystery of not knowing ACs and HPs of their enemies and kept the information secret, just like in tabletop. At the time, other more experience DMs were providing that information, but I did not switch over. Then after DMing for a year, I talked with several of my players and we realized that from a meta-game point of view it really did not change any decisions in combat if they knew the information. So the whole point of keeping the secrets was sorta moot. Besides, once they knew the monster most players can look up the stats to know what they are faced with anyway if they wanted. Nature of PbP is a DM and players have plenty of time to prepare if they need it. However, if they have that information they know if they hit and/or kill AND they do not hold up the game to wait on a DM update. That is a BIG plus in PbP. I had to really emphasize that point. Additionally, the players can actually write their own combat results into their posts as well, saves DM work on their updates. Then the DM focuses on updating his notes from the players' results, then writes the bad guys actions only. As a PbP writer (player and DM) this is as important as game-play itself. With the slow (almost glacial pace of PbP) combat can really drag a game down. Anything that makes it move faster without losing something critical in the process is a good idea. A role-playing game is a game in which the participants assume the roles of characters and collaboratively create stories, determining the actions of their characters based on their individual characterizations. The game-play (or roll-playing) aspects are how the actions are adjudicated within the defined rule sets and mechanics. The role-playing aspects are centered around the characterization. Characterization is the way in which the players convey information about their characters; it can be direct, as when the writer simply tells what a character is like (ie. "George was cunning and greedy.") or indirect, as when the writer shows what a character is like by portraying his or her actions, speech, or thoughts (ie. "On the crowded subway, George slipped his hand into the man's coat pocket and withdrew the wallet, undetected."). Descriptions of a character's appearance, behavior, interests, way of speaking, and other mannerisms are all part of characterization. Good role-playing goes hand in hand with good characterization and is a crucial part of making a story compelling. GMs are only responsible for the portrayal of the supporting cast (NPCs); it is the players that are ones to develop the characterization of the protagonists (Player Characters). In order to capture interest, the players provide details that make their characters life-like and individual, making them seem real. Good characterization gives the readers a strong sense of the character's personality and complexity; it makes characters vivid, alive and believable. Good role-playing results in showing a developed persona that is not the same as the player's own personality as well. • Describes the environment and their character's interaction with it. The art doing this well is to sprinkle these things throughout all of the player's posts naturally and unforced, yet avoiding the shotgun approach to put as many as they can into every post. It should be obvious, but good role-playing in PbP requires good writing.